Biohort starts the New Year with a 'big bang' and new innovations. WORLDWIDE INNOVATION the Ground Screw Foundation: a modern, concrete free solution for uneven ground surfaces with incline of up to 10% • No concrete, no dirt, no unnecessary delays • optimum level adjustment and secure against storms. MINIGARAGE: Multi-purpose space saver with no planning approval required. 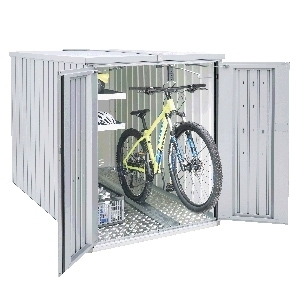 Ideal for bicycles, gardening equipment and much more. 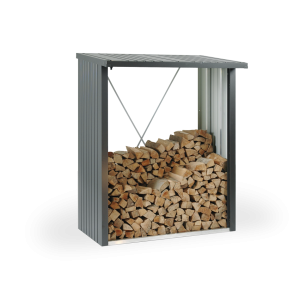 With a height of only 145 cm the Minigarage does not require planning approval. Our continuing increase in turnover finally demanded a new production and storage location. As the space available at our headquarters at Neufelden had been fully used, a new 4 hectare plot of land was purchased in a neighbouring village. In the first phase of our production expansion a new 11.000m² facility with modern production hall and high-bay warehouse will be erected by the summer of 2017. The complete investment will cost ca. € 20 Mio. The planned completion of this expansion is the end of 2018. Our headquarters will remain in Neufelden. We start the new garden season with a lot of innovations: The new trend colour metallic quartz grey and new sizes for the Equipment Locker and the HighBoard, an upgrading of the garden shed AvantGarde with stainless steel door handle and standard cylinder and with the inclusion of new, innovative accessories: the suspension basket and hook-set. A re-launch of our website www.biohort.com took place at the end of July. With numerous new features and integrated on-line shop, the new design focuses firmly on the future. In 2016 Biohort was once more recipent of awards: Location-Corona, Mühlviertler Business Award and the TYPO3-Award. Our business year 2016 ended on a very successful high-note. We increased our sales volume by over 16% to € 47,5 Mio. Biohort now employs over 210 personnel. The Federal President of Austria Dr. Heinz Fischer confers the honorary title "Councillor of Commerce" to CEO Josef Priglinger by decree. With this, he honors Mr Priglinger's managerial performance. The certificates was presented in a ceremonial act by the President of the Upper Austrian Economic Chamber, Rudolf Trauner. The new Biohort-Online Shop is online. This makes shopping of Biohort-products much easier! In springtime, Biohort starts the building of a new hall for cold storage with a capacity of 5.000m². On the "Biohort-open day" on the 6th of September 2015, the new building was opened ceremoniously with Dr. Josef Priglinger and the governor of Upper Austria, Dr. Josef Pühringer. More than 2,000 guests took the opportunity and participated in factory tours. The business year 2015 was again very successful for the Biohort GmbH. Biohort could increase the turnover by 29% EUR 41 Mio. Biohort employs more than 200 employees. 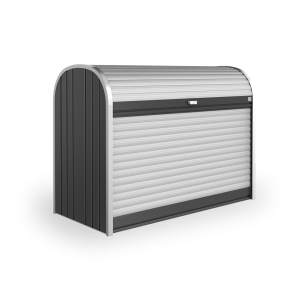 The garden shed HighLine® is now available in the new noble colour white, whichs boosts the sales figures. The favourite LeisureTime Box is expanded by the new size 160HIGH and presents itself as the ideal solution for storing big lounge cushions. 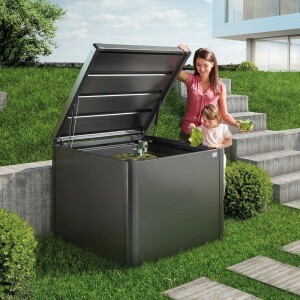 At the garden fair GAFA in Cologne, Biohort presents its product novelties: The HighBoard and the LoungeBox® are the responses to the increasing demand for storage solutions for cushions, outdoor kitchens incl. equipment, garden equipment etc. Local business award - category "Youth and Professionals". Biohort moves on on his way of expansion and develops more countries in Northern Europe. Biohort starts with a modernisation of its marketing presence and a "fireworks" of innovations into the new year. 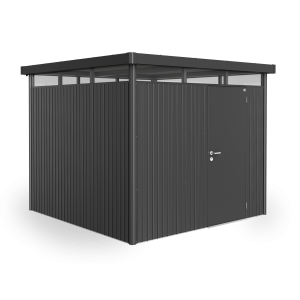 The new garden shed HighLine® exceeds all expactions - recognizable by the masses of show model orders. The new assembly instructions are revolutionary. Thanks to the system "Lego-technology", there are nearly no texts now. On the 26th of April in 2013 Biohort celebrates "15 years in Neufelden" and the finalisation of the new building with a big opening gala with a lot of VIPs. Biohort wins the coveted business award "Pegasus in gold" in the category medium-sized businesses. Business Medal of the Upper Austrian Economic Chamber for Dr. Josef Priglinger. INEO-Award for its commendable teaching operations 2013 – 2016. 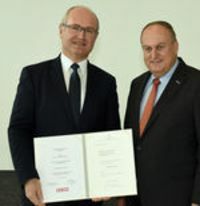 „SME-niches-world champion“ – awarded by the Austrian Economic Chamber. The building of our new production hall is going on. With this new building our production surface amounts to 20,000 m². 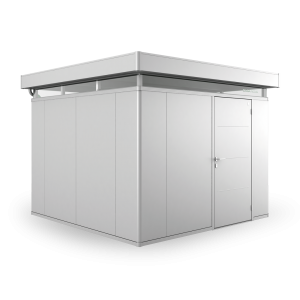 From 2nd to 4th of September Biohort presents their new innovative product novelties at the renowned fair GAFA in Cologne/Germany: the garden shed HighLine® and the GarageBox excite the expert audience! In December the new machines and devices are installed in the three new production halls. The bright halls with an underfloor heating system afford our employees the best conditions for a high-quality and productive work. In January, the former property of the Vogt Electronics Company, in neighbouring Niederwaldkirchen, Austria is acquired. As well as offering 6,000 m² of warehouse and office space, there are also 15,000 m² of undeveloped business premises available for future expansion. The Biohort sister company, Ascendor Lift Technology moves into the premises in September after renovations are completed. The Garden Shed "AvantGarde®" wins the coveted "red dot" Product Design award and Biohort receives a 4th Place in the "Pegasus" Business Awards. New products are the Garden Shed “Europa” in metallic silver and the "StoreMax" in metallic dark grey and metallic silver. The new insulated Annexe "CasaNova" also helps boost the sale of all storage solutions, resulting in a 30% increase in sales by June and requiring maximum production performance from the workers in the factory. A nationwide network of sales representatives is established in Spain and Italy and thanks to major listings; sales are going well in these export markets. 2nd place „TRIO of the year“ 2011 – category trade of the famous Austrian economy magazine „Trend“. In November 2011, the ceremonial ground-breaking took place to start the building of the next expansion of approx. 6000 m² floor space of Biohort premises in Neufelden. This will help Europe's market leader for high-quality metal storage solutions to continue to meet the increasing demands for its high quality products. The popular "LeisureTime Box" in a technically and visually enhanced version with flat lid is brought onto the market. 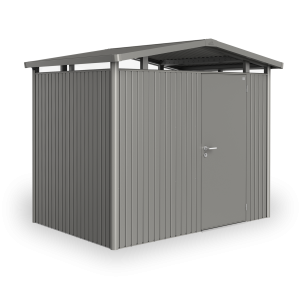 The Garden Shed “Europa” in the new colour scheme of metallic dark grey also records strong sales results. The first design-insulated outbuilding "CasaNova" is presented to the trade in autumn 2010 at the International Trade Fair "GAFA" in Cologne and immediately earns admiring glances. The screw-free exterior walls and a skylight made of acrylic glass running around the whole upper wall create a stunning impression. 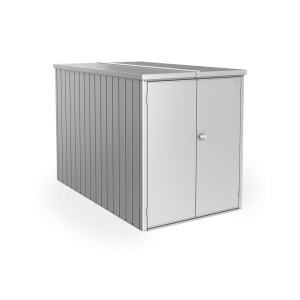 The "CasaNova" is constructed from insulated sandwich panels with 40mm polystyrene core and is capable of withstanding a snow load of 215kg/m². It can even be fitted with an overhead sectional garage door. „Goldene Securitas 2010“ nomination – category „Working securely and healthy“ The website is redesigned and now includes an online configurator, a Personal Advisor service and a "Biohort in my garden" tool. The new Biohort extension, built next to the existing factory is officially opened and the staff are divided between the two works. A new production, warehouse and office space totalling 4,500 m2 is available for further expansion. Biohort is now listed in Germany and Austria by all the best known hardware stores and retail outlets and the company presence in all the export markets is developing well. 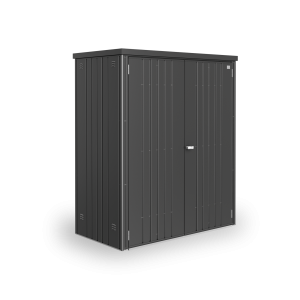 The new colour scheme metallic dark grey and the Garden Shed "AvantGarde®" size XXL help sales figures to grow in a double figure sum, even in difficult economic times. The multitalent WoodStock® is launched. 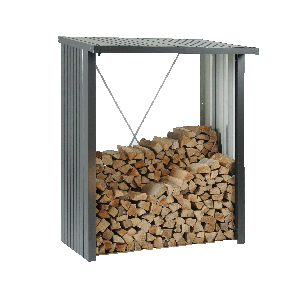 With the WoodStock® Biohort meets the customers' demands for a firewood storage. 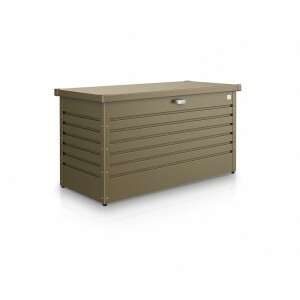 Thanks to the diverse range of extension possiblities the WoodStock® can also be used as a Equipment Locker. Biohort grows up to more than 50 employees and starts a modern new building in July. A lot of presented novelties fascinate the trade professionals and visitors at the international fair trade "GAFA 2008" in Cologne. 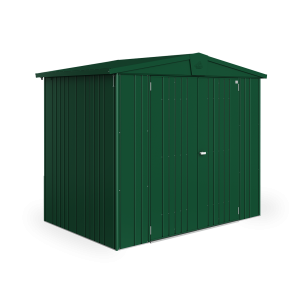 The garden shed "AvantGarde®" is now offered in the additional size XL and the additional colour dark green. Biohort expands its distribution network: more than 30 self-employed sales agents work for Biohort incl. France, the Netherlands and Denmark. The sister company Ascendor Lifttechnik is founded and manufactures high-quality and design-orientated platform-stair lifts (www.Ascendor.at). 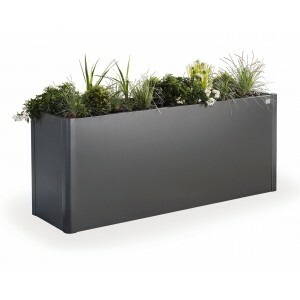 The model "AvantGarde®" is offered for retail in 2 sizes and within the same year becomes Biohort's best-seller. The sales figures for our other products also rise to record levels, enabling the company to present a 36% increase in sales figures. As a result of this success we recruit new personnel to assist us in the areas of production and administration. 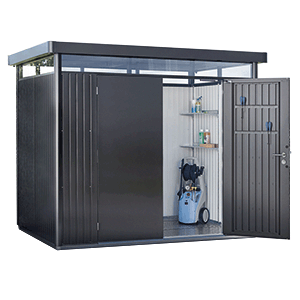 The new Garden Shed "AvantGarde®" is the first metal Garden Shed to justify the claim to be regarded as modern architecture! In its metallic silver colour this model is perfectly in step with modern trends. At the Spoga 2005 this elegant design from Biohort was presented to trade visitors for the first time. The new garden railing system "Leonardo" is presented to the trade public at the GAFA 2004 and meets with an enthusiastic response. "Leonardo" is the first metal lattice railing system, which combines uncomplicated and simple self-installation with all the advantages of an aluminium construction. With this new business area "railing system" BIOHORT is now looking to attract trade custom from the building material sector. 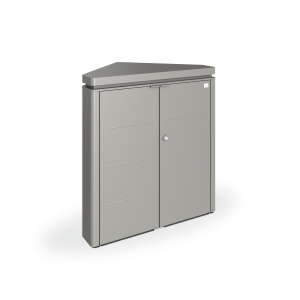 Furthermore the "StoreMax® 120" specially designed to take 2 dustbins – and the "Equipment Locker" in dark green are introduced to extend the BIOHORT product range. 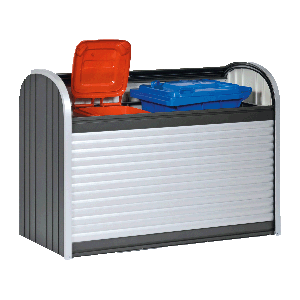 The Rollup Unibox 180" is replaced by the new "StoreMax® 190". At the behest of customers and in accordance with market trends, the Garden Shed "EUROPA" is now offered in dark green with an grey-white interior finish. 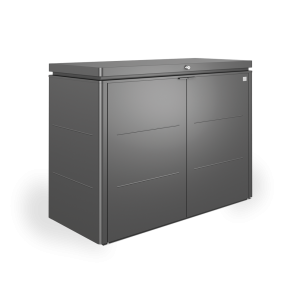 To fulfil the demands for a compact storage solution, BIOHORT introduces the "Equipment Locker" in metallic-silver finish at the GAFA 2003 Trade Fair. To ensure that future expansion requirements are guaranteed, "Hall 4" with a production space of 1.350 m² is purchased. The export sales of the "StoreMax® 160" are a total success. At the "IHM 2002" in Munich an attractive enclosure for dustbins, the "CoverBox" is presented to a receptive public. Thanks to participation at Trade Fairs in Cologne, Birmingham, Paris and Munich, BIOHORT succeeds in introducing its products into additional sales markets. 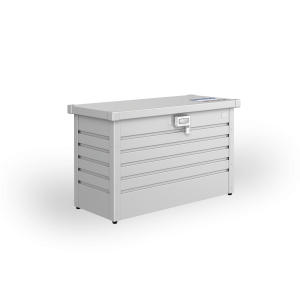 The company name BIOHORT is now becoming well known throughout Europe and is a byword in trade circles for "high quality storage solutions made out of metal". The Garden Shed "Europa" previously available in dark brown is now offered in a modern quartz-grey standard colour. 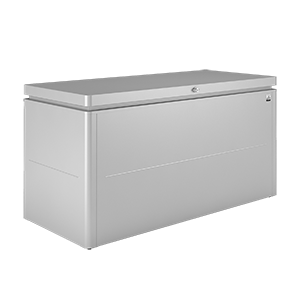 The new storage concept "StoreMax® 160" is introduced in spring to an enthusiastic reception. At its presentation at the "GAFA 2001" in Cologne, the "StoreMax® 160" rapidly becomes a ‘box-office success’ for the company. The previously rented factory space (4000m²) including undeveloped area, plus a plot of land (12.437m²) for future expansion is purchased. 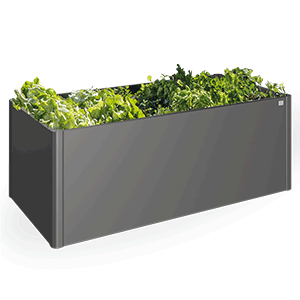 The new BIOHORT "Rollup Unibox 180" is introduced and leads the way for the new design orientated product development phase at BIOHORT. Beginning of the distribution in France, Italy and the Netherlands. The annual turnover rises to € 4,4 Mio., Exports now account for 67% of this sum. BIOHORT is now listed at the majority of the Austrian DIY- and home improvement marts. BIOHORT is also listed in Germany at the 8 largest marts. Exports to U.S.A. account for €220.000,-. The turnover since the take-over of BIOHORT has now doubled to € 3,65 Mio annually. BIOHORT Garden Equipment Ltd. moves into larger premises at Purnstein 43, A-4120 Neufelden. 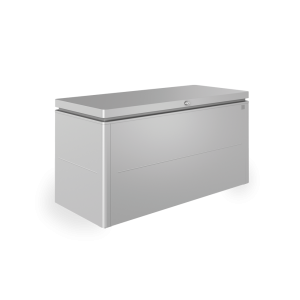 The BIOHORT "Leisure Time Box" in 3 different sizes is introduced to the product range. In Germany our products are now listed by BayWA, Hagebau and Dehner. On the 25th of September 1997 Dr. Priglinger assumes 100% control of BIOHORT, by buying out from NORMSTAHL, at the same time NORMSTAHL sells its garage door production to the Swedish firm CARDO A.S. The product range is purged and then revised with the introduction of new products. The new Garden Shed model "Europa" is presented at the Garden Trade Fair "GAFA ‘96" in Cologne. Dr. Josef Priglinger is entrusted with the responsibility of running the company, alongside the specialist trade, the scope of sales and distribution is broadened to include Home improvement and DIY markets (the company’s first success, it is listed by BauMax). The Garden equipment sales now amount to € 1,6 Mio. BIOHORT begins its sales offensive in the German and Swiss markets. Outsourcing of the garden products division in the newly founded BIOHORT Garden Equipment Ltd. which is also now responsible for the distribution and sales. 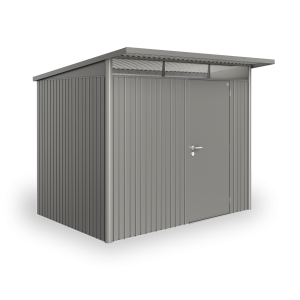 The production of metal Garden Sheds begins in the NORMSTAHL-Works in Niederwaldkirchen. The sales are handled by the marketing department of NORMSTAHL Garage Doors, Moosburg (BRD). 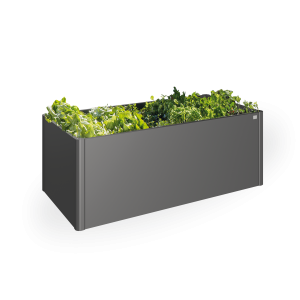 During the course of the year the product selection is widened to include a metal composter and seedling bed, both also made from metal.